Dorothy had it absolutely right. There’s no place like home. Friday morning, a little more than a week after a serious skunking on the Davidson, it felt good to be walking down the path to my regular out-of-the-way spots on the Haw River. I hoped that the previous couple of warm days, an overcast sky, and an approaching front would spur the largemouths into action. I originally intended to take the new 8wt out for the first time, but at the last moment pulled out my workhorse 6wt, hoping for more than just casting practice. In retrospect, the 8 might have been the way to go. This was my first time back on the Haw since late November and it was comfortable being in the river again, though it took a little while to get re-acclimated to the challenging footing. The river was running high and fast, but it has been pretty much all winter. I haven’t seen my favorite fishing levels for many, many weeks, leading me to wonder what this spring will bring. The water was slightly stained, fine for fishing, and its temperature was an improving 48, right about the wakeup point for largemouth bass. At least I hoped so. Old habits die hard, so I started with my summer favorite, an Orvis Gully Fish, and fished the surface of slow edges without a sniff. 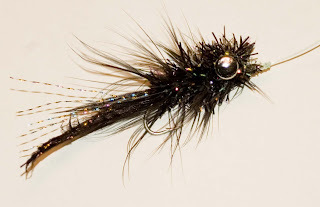 Eventually (an hour later), I let sanity creep in and tied on a fly that’s been hanging around in my box for several months, a black Murray’s Marauder that a buddy had given me for smallies, and started dragging the bottom of deeper holes. That technique is always a challenge on the Haw due to the rugged rocky bottom, but it paid off after a while with a 10 inch largemouth from a small side braid, my first fish out of the river this year. Encouraged, I stayed with the fly, but moved upstream to a spot where this braid of the river widens out, slows down, and has a bunch of mid-stream still spots and back eddies. I quickly hooked a healthy 14 inch fish that had a good bit of fight to him, despite it still being cold. I was starting to have some fun, and it would only get better. I continued upstream, crossed against a challenging, though shallow, current just above the slow stretch, and started working the holes just below the rapids. I was dragging the Marauder through a couple mid-stream deep holes, slowly figure-eighting, thumb and little finger, along the bottom, when for the 20th time I hung in the rocks… or so I thought. It gave a little, then took a lot, and quickly became a good fish in play. For the first time in longer than I can remember, I put a fish on the reel, unsure that I could give him stripped line consistently enough with my cold hands. My reel's drag was set a bit stiff, but he was still able to take it in short bursts so I felt comfortable with its setting. After a splendid couple of minutes, I was holding a beautiful, stout, 19 inch largemouth, in rich dark colors and surprisingly stocky for a wintered fish. I have caught a couple of others of this length on the Haw, but none quite as muscular or as classically marked. I admired him, then released him and, as he swam away, I began to wonder if he was the biggest largemouth that I had ever caught on a fly rod. That uncertainty lasted exactly one cast. After turning the fish loose, I tossed the Marauder back into the same hole, stripped a couple times, and seemed to hang in the rocks again. But like the previous hangup, it gave a little, then once again steadily pulled away. For a weird second, I thought it was the same darn fish but, once I got it to the reel again, this one had no trouble taking line off in big chunks. It never jumped, but it boiled the surface several times, showing a slab of a side and an unwillingness to come my way. The 8wt would have been handy as it took several minutes of wrangling to bring in this chunk of a fish, a solid 22 inches, thick of body and a mouth I could have squeezed my fist in. As I finally grabbed him up by his lower lip, the Marauder simply dropped out of his mouth so I had been sitting on the edge during the fight. This fish was as ugly as the previous had been pretty. In his past he had lost an eye and had long-healed scars running along his dorsal surface, implying some bygone encounter with a larger predator, probably a hawk or eagle, plenty of which exist on the Haw. This was an old warrior. He had definitely fought like one. Alas, no camera. I’ve been meaning to get a dunkable, mashable, stream camera for a while but hadn’t pulled the trigger on it yet. I had my cell phone with camera capability, but it was tucked away a small dry pouch, in a zippered shirt pocket, under my waders. I had a 6-7 pound, played out bass in one hand, a fly rod in the other, and 50 yards of tricky wading to the nearest shore. The fish was too exhausted to take the kind of time needed and the old warrior deserved better than to expire because I wanted a glory shot, so back into the Haw he went, undocumented, hopefully for a picture on another day. Once released, he hung around my feet for a minute or so, gathering strength, and finally eased back into the depths. Seeing him swim away, I wondered if some of the carp I thought I had been watching navigate the river were actually more bass like him. The wind that had been steadily building was starting to be a real issue and my planned noon departure had long passed but the fish were getting bigger with every catch. I was reluctant to end the day. It was another of those constant “commitments versus good fishing” dilemmas, but an awkward misstep and a bit of a dunking, what I’ve come to call the Haw River Two-Step, helped make up my mind. (Such steps are why I need the dunkable camera). I sloshed back up the trail to the truck, thinking all the while how this just might be a very good year on the Haw. There's no place like home.